Okay...I've scanned through the 94 previous messages in this forum about Rendezvous power windows and, based on what several of you have said, this is something that can be repaired by the owner (me) and I can probably avoid the dealiership. A lot of the discussion in the previous messages related to "clips" and I'm hoping that replacement of broken clips will resolve my problem. But before I go to the trouble of taking the door apart, let me just describe what the window does and doesn't do. First off, it does not go up and down when I push the button (duh). It will, however, slide up and down if I put the window between my palms and push it up and down. Also, the window will slide up and down "crooked" (that is, not evenly). Is this consident with broken clips? Thanks in advance to anyone who replies. Yes, It sounds like it. I did take the door panel off to check myself to be sure. I did purchase the clips from the recommended place (I'm not sure but I think it was in Florida). One of the clips I thought at first was wrong but it was put together backwards (good old GM) and I was able to fix it and it worked great for less than $150 for both windows. Took me about 2 1/2 hours to do both but I am a slow and analyzing type person. Take your time, take pictures before you take it apart and as you do it just in case. Good luck. Just did the A/C condenser this past weekend, not too bad, but there were some pain bolts and nuts, plus you do need someone to help you move the engine forward after you are done to attach the engine mounts, and it essentially requires you removing just about everything to get the condenser out. But in the end, I estimate that total parts cost me about $225-$250. Plus I changed my oil, replaced the oil filter, and replaced all the old coolant in radiatior. Really ned to change plugs and wires. Anyone know how to replace the plugs in the back (the ones against the firewall)???? The below is copied from a previous post (#36) on the subject. This will be easier with a pop clip tool. Then a lot a patience to remove the electrical connectors. Then a blade to slice through the adhesive holding the plastic sheeting behind the door panel. Then your standard ratchet and wrenches. Give yourself at least three hours daylight (and warmth) to get this done. 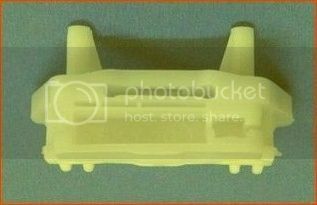 Buick Rendezvous (and maybe Pontiac Aztek) Window Regulator Clip Replacement $40 total!!! After having our driver window stop working 4 months after buying our Rendezvous and the dealer wanting $275 for the whole motor/regulator/clip assembly I decided to look around for a replacement. Car-part.com led me to 3 different salvage yards, all telling me the same thing as the dealer, the clips cannot be purchased separately but they would be glad to sell me the whole setup for $100. The first salvage yard called me after i placed the order and said they had broke the clips removing it from the door. The second salvage yard could not find the door....ya, it disappeared! the whole door! The third was going to be the charm, after a week I called them and they said they had broke the clips also. I was content with the door panel off and my 1x4 with a notch holding the window up....but the boss said she didnt want to drive a ghetto vehicle. Then 3 weeks ago the passenger door clips broke! Talk about a total POS design flaw. 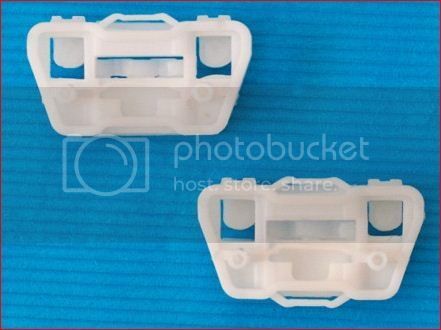 So internet searching led me to the Buick forums where I found the part numbers for the clips. Since my clips were broke in about 12 pieces I had no idea how to replace them....but about an hour later both side were done. Here is the passenger side regulator removed from the door....I think about 5 10mm bolts held it on. Here is the small "barrel" that snaps into the clip and moves it up and down the window. So your ready to try it yourself? I would say most people with a little brain can do this with no problem. Check out the link / info at post # 36. The left part number is #15286776 and the right is #15286777.
well... the window won't go up. I believe the clips are still good as the window is pretty sturdy (no wobbliness to it). But, I need help in replacing the motor/regulator. I have the insides of the door exposed, looking at black "framing" inside door (as seen in another posters pictures earlier in thread). Do I need to take this whole thing out? Do I need to get the window in the up position? How do I do these things? Please help! LOL. Not a "gearhead" by any means... which is unfortunate. Thanks to everyone who posted here. I wanted to let any Aztek owners that find this thread by googling know that the same clips are used on Azteks, and the procedure is exactly the same. There isn't a similar thread in the Aztek forum. The newer, better clip part numbers are 1593-8039 and 1593-8040. You can tell the difference in that the new ones use black plastic instead of white. 36 and 31 bucks full price. The buick dealer I called wanted 38 and 35, so I called my old Pontiac dealer, (now GMC), and got them cheaper. Took them 1 day to get them in from warehouse. Any one still wanting to know if these front clips will work on the back doors?? Thanks for confiming that. My dealer gave me the same answer and wanted $35 each for the 2 clips. GMpartsdirect.com has them for $19 each. Dorman aftermarket regulators for the front are at Federated auto parts store for $90 for the whole assembly. Just finished doing this job on the front passenger window. Ordered the parts from gmpartsdirect.com. New parts are made from the same thermoplastic - polyoxymethylene aka Delrin. Part has been redesigned with more, thicker reinforcing ribs. Should last a lot longer. To remove the door panel without tools, start by prying at the triangular panel that covers the side mirror access hole / contains tweeter speaker. Once it is pried away, you should be able to pop out the door panel one pin at a time without a screwdriver. Before taking prying off from the last couple of pins, get a helper to hold the panel by the door handle - it's awkward for one person. Be very careful with the window and lock switches - they are delicate. While trying to disconnect the window switch, I actually pulled it apart. I would recommend getting on the ground on your back and using a screwdriver to release the barb socket. 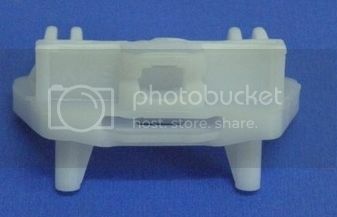 The door switch can be popped out intact, but you will likely break one of the retaining tabs in the door panel socket. Once again, release the barb socket with a screwdriver. The pictures in post 36 were really useful. The clip on the outer rail is easy. The clip on the inner rail - the side closest to door hinge was harder. I ended up removing the door speaker - the magnet will hold it to the door - no need to disconnect. Then, remove the two bottom screws which hold the rail and motor in place. You should then be able to move the rail to a position where there is enough room to swing the clip over the rail and lock to the barrel. I'd like to plug a flashlight that I bought recently and used during this job - gorillatorch. Extremely small, bright, bendable, and rare-earth magnets in the feet. Thanks to everyone that has posted before - you made this job easy! I just replaced the clips on the left front window of my '02 Rendezvous. Then when I tested it, it was making a loud noise like it was catching on something. I noticed the cable that goes on the wheels/pulleys keeps coming off the track because it is loose. Does anyone know how I can fix it? Those part numbers do not match. Those part numbers show metal clips. The ones I have are like those in the how-to pictures - they are plastic. Do you have another part number? I am a 64 yr. old granny and with your help I fixed my own window regulator :shades: . I'm on a fixed income so this really helped. If I can do it, anyone can. I'd like to mention that the part #s have been changed from 15286776 to 15938039 and 15286777 to 15938040. Thank you so much for your pictures and posts. Well I got my window clip parts in the mail after about 10 days. Looked at both parts and found the black clips to be broken where they fit over the metal nubs that hold them in correct position horizontally in the assembly. Looks like the black plastic pieces were just shoved on all the way they could go resulting in the breaks. I looked at the existing clips to see how they were supposed to be. Planning to ask for refund and then get the parts locally unless they will overnight new ones to me. 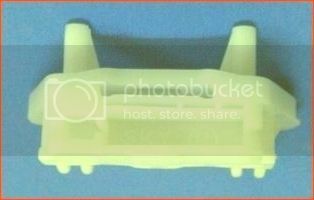 I stock quite a few clips and stumbled over this thread (trying to get some help for a customer with Buick Roadmaster). Noticed that the clips discussed here resemble some I have in stock. Does anybody have a good picture of the clips? Are they similar to those below? If so, which are needed? If there is any chance they might fit, I would provide a 'guniea' pig with a pair (against the promise to provide a DIY write up/photos to post up here). My 02 Rendevous had the problem of broken plastic clips. I bought these https://www.amazon.com/gp/product/B00GEBYS20/ref=oh_aui_detailpage_o00_s00?ie=UTF8&psc=1 . Under $9 later, and my driver window works. The plastic clips broke, so, the metal things with rubber pads that you snug up to the window were on the window. I taped the window to the door and removed the whole assembly. I attached the plastic clips to the regulator. I put the regulator assembly back in, and I started all the 10mm bolts that hold the regulator in place. I then lowered the window to get the metal things with the rubber dodads that hold your window. I adjusted the regulator to where I'd have easy access to the 10mm bolts to snug up the window in those clamps. I did that and tightened down the regulator with it's five 10mm bolts. I'd say it was about a 45min job to tear down the door, fix it, and put it back together. The tricky part was figuring out how it all fit together, which way the plastic clips are facing, and etc. You'll find that they can only go one way.